When we think of lone workers we usually imagine those working in complete isolation such as a security guard manning a building at night, or a farmer working out in the middle of a field. However, while this may be true for many, lone working doesn’t always mean being completely alone. Lone workers may very well operate in highly populated areas or alongside clients, customers and members of the public. Narrowing our definition of lone workers down to those completely in isolation means that many of our employees are not being included in our lone worker policy and are not receiving the level of protection they need as a result. So, what then constitutes lone working and how can we identify lone workers in our organization? 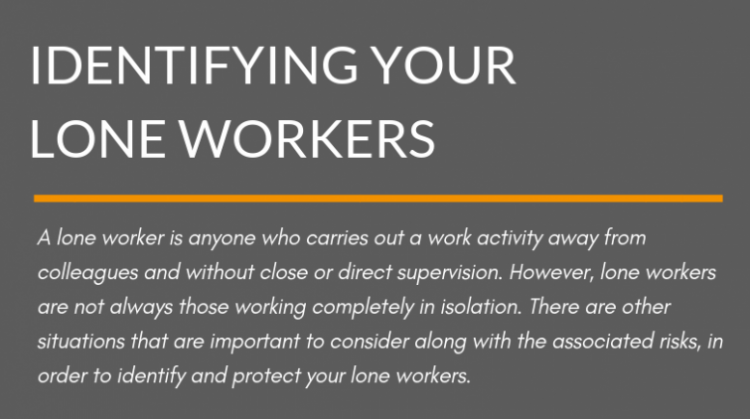 A lone worker is anyone working without the direct and immediate support of supervisors or colleagues. To put it simply, if an employee cannot be seen or heard by a colleague, they are lone working, whether that be for all or part of their working day. Some of your lone workers will be easy to identify by assessing work patterns and roles. However, there may be times where you may not even be aware that your employees are lone working. It may be useful to talk to your employees and ask the below questions to identify any ‘hidden lone workers’ in your organization. Do colleagues work in different parts of a building or site? E.g. two cleaners working on different floors. If working on a noisy site, will a colleague be able to see/hear another colleague if they need help? Do your employees travel alone during working hours? Are there times where employees working as pairs will be separated? E.g. taking separate lunch breaks. Will any of your employees be left working alone if a colleague is on leave? Are there times where an employee is left to man the shop floor alone? Are single employees left working late in the office or other work sites? Once lone working practices have been identified, it is important that you risk assess each of these situations and put measures in place to ensure your employees are safe. There are of course different risks associated with the level of isolation that comes with lone working. Those out in a remote and completely isolated location are more exposed to environmental risks that could lead to an accident, while those working alongside members of the public or in client’s home are at higher risk of experiencing violence and aggression. 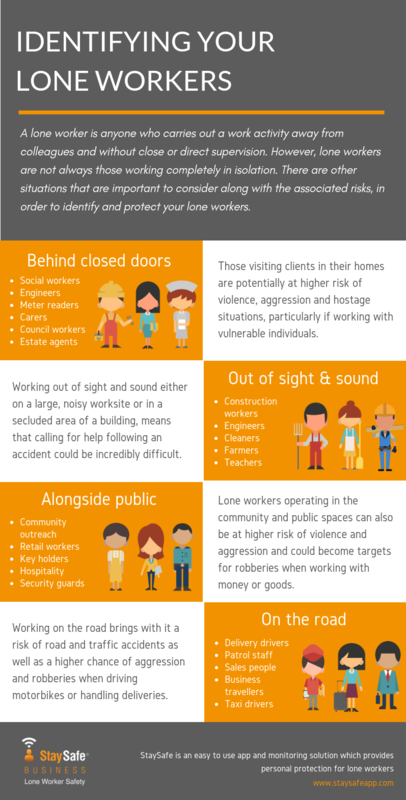 We have produced an infographic that outlines some of the different types of lone working, examples of different roles associated with such situations and the risks that they may face. For more information on how you can protect your lone workers, send us an email, a member of our team will be happy to help!